greenlight.guru announces the release of their new cloud-based Risk Management Software exclusively for medical device companies to help reduce risk and ensure compliance. 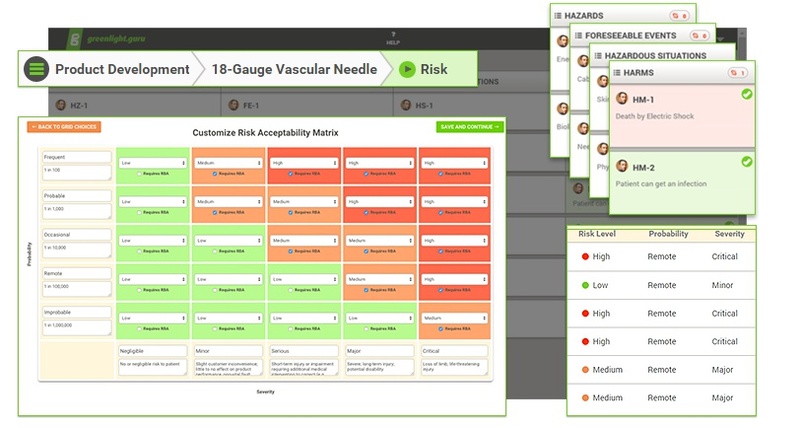 INDIANAPOLIS, IN (PRWEB) - greenlight.guru, a quality management, design control, and now risk management solution provider for medical device companies, today announced the release of their brand new risk management software feature set. greenlight.guru’s cloud-based risk management software is the first and only software solution designed to align directly with the ISO 14971 standard for medical devices. “The future of medical device quality systems and documentation is going to look a lot different than the past,” greenlight.guru CEO and Co-founder David DeRam explained. He continued, “Regulatory bodies such as FDA and EU Competent Authorities expect risk management activities to be part of the design controls process and for the risk management file to be living throughout the product’s whole lifecycle. We've had the opportunity to speak with hundreds of medical device companies and have learned that our customers are interested in making risk management part of the entire product lifecycle. This allows them to not only build better products, but to run better businesses." Once a project is complete and launched into production, device makers now have the opportunity to easily keep their risk management file up-to-date and living throughout the entire product lifecycle. Because greenlight.guru’s solution was built with ease of use as a top priority, no longer will risk management be a discouraging process with little visibility. Now device makers’ risk management processes will be integrated across their entire quality management system. greenlight.guru’s risk management feature set was designed specifically to help device makers ensure compliance with government regulations and industry standards such as 21 CFR Part 820 and ISO 14971. The cloud-based system is the first and only built to follow the medical device risk management industry standard, ISO 14971, process directly in a 1 to 1 model. 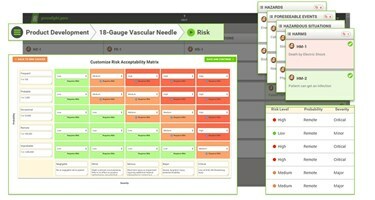 Inside of greenlight.guru’s risk management solution device makers are able to seamlessly link risk management activities to the product development design control traceability matrix. They are then able to toggle back and forth between design controls and risk management with the click of a button. For successful quality management, a consistent approach in assessing and mitigating risk is essential. With greenlight.guru device makers are able to clearly identify risk acceptability criteria with an easy to use, graphical interface that directly ties to the design control matrix. greenlight.guru produces beautifully simple software solutions for medical device companies to allow them to bring high quality products to market faster, while reducing risk and simplifying regulatory compliance. greenlight.guru’s eQMS software solution provides device makers a Single Source of Truth by integrating the management of design controls, risk, controlled documents, and quality processes in one, easy to use, cloud-based platform.